Join Festmeister Hans and Gretel for a tour of the Alpine Restaurant! 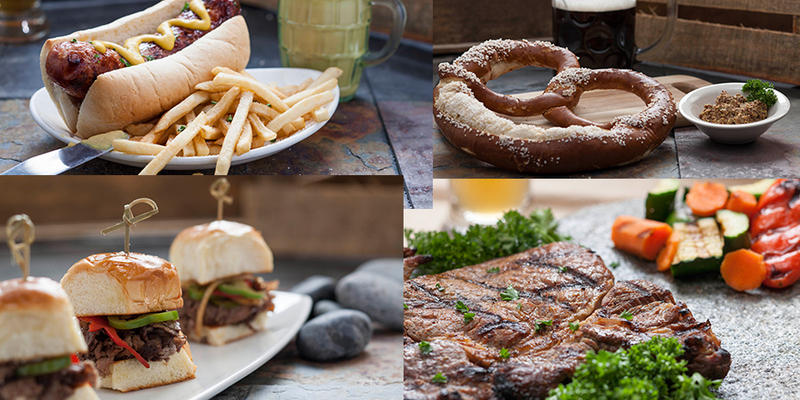 The Alpine Village Restaurant is a European inspired tavern featuring a fine selection of craft beer, housemade artisan sausages and a variety of European and American flavors. We’ve recently updated our menu with some of your favorites along with some new dishes, so stop by The Alpine Village Restaurant to see what’s cooking! Most nights we feature LIVE ENTERTAINMENT. We’re open five days a week (Monday and Tuesday we rest!) and have a FANTASTIC Sunday Champagne Brunch every weekend. Check us out for special events and especially on days when German soccer teams are televised. At the early age of nine years old, Alexander Lagger started learning his craft by helping his father in the butcher shop during summer vacation. For over 25 years Alex has been the butcher and sausage master at the Alpine Market. We are proud to bring you some of his traditional old-world, German crafted sausage and meats. The Alpine Market features many more of the haus-made meats by Alex. Visit us at the Alpine Market and bring some German tradition home. All of our burgers are served with your choice of cheddar, Swiss, or pepper jack cheese on a Kaiser specialty bun with a choice of one side. seasoned ground beef patty, pepper jack cheese, with crisp bacon, lettuce, tomato, onion, a German pickle spear on the side and includes your choice of side. Jalapenos available on request. Join us weekdays between 4pm and 6pm for these specially priced and portioned dinner favorites. Dinners include one side item, Market fresh bread with butter, and coffee or tea. No substitutions, please. French Fries, Red Cabbage, Coleslaw, Sauerkraut, Sauteed Fresh Vegetables, Rice Pilaf, Spätzle, German Fried Potato, Gurkensalat (Cucumber Salad), Garlic Mashed Potato, German Potato Salad.